Have you been to Carrot Common? From the products to the atmosphere, this is a health food paradise worth visiting! The staff are immensely helpful and are willing to assist in answering even the silliest-seeming questions or with finding any product you need. The shops have the air of being small-town specialty stores where everyone knows your name! The Carrot Common - completed in 1988 - is a collection of 17 shops and eateries tucked away on Danforth Avenue just east of Broadview Avenue. The ground floor features a number of engaging retail destinations including The Big Carrot Juice store, Aroo natural clothing, Inspired Life, and 100 Mile Store. They even have a fantastic vegetarian deli with over 100 veggie dishes - a veritable vegan heaven! The second floor has been developed as a natural health centre with over 30 therapists and counseling practices. We feel very much a part of this community! Working in The Danforth neighbourhood, Carrot Common is a frequent stop for the urbaneer team. Just yesterday, we popped by The Big Carrot juice bar for a shake with mocha, banana, almond milk, and other proteins to get our day energized. We felt great all day! Then we hit the prepared food bar; the selections are changing all the time, making it hard to choose just a few per visit! We crave them all! The Carrot Common offers great value, an engaging atmosphere, and the feel-good benefit of supporting a worthwhile initiative! Carrot Common is a co-op in partnership with Carrot Cache, which channels a percentage of the Common's profits into supporting organic agriculture and co-operative businesses. The Carrot Cache fund invests in Canadians working on local and international co-operatives where organic agriculture and/or community food strategies are being promoted. The net impact of the fund is inspiring: over the last 9 years, Carrot Cache has granted more than $1 million to more than 165 organizations and individuals. You'll never guess what is above you and out of site: a green roof! The Carrot Green Roof is an urban gardening and community resource centre located on the roof of the Carrot Common. Still evolving, this space will be among the first of its kind in the city, where the public can view diverse vegetation, as well as intensive and extensive gardens (including the experimental vertical gardens that are currently being cultivated!) Fully-realized, the Carrot Green Roof will be a place to meet, explore, research, and learn! Carrot Common is a demonstration of how different types of partners can successfully create a collective focused on community development while building a successful business venture on health, well-being, and organic living! 348 Danforth Avenue, near Chester. Could you imagine strolling here at your leisure to elevate your everyday? 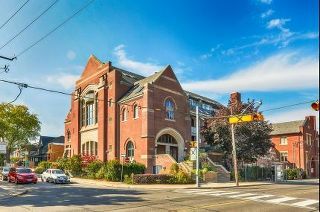 For the lucky new owner of this fresh - and rare-to market - 2bed 2bath Heavenly Sanctuary In A Converted Riverdale Church offered at $949,000, The Carrot Common will be just a hop, skip and a jump away! Dreamy! !